With all the uncertainty, I don't imagine Android Wear smartwatches will be a hot item this holiday season. Some people are probably still willing to take a risk, but pickings are getting slim either way. Even though it launched more than a year ago, the Huawei Watch is still considered by many to be the best Android Wear device. It's no longer on sale in the Google Store, though. The Huawei Watch was the first Wear device that didn't have any obvious compromises. The display was completely round, it was compact, and it had a good selection of bands. Google's affection for the watch is evidenced by its use as a developer device in the Wear 2.0 beta. However, that didn't save it from the chopping block. 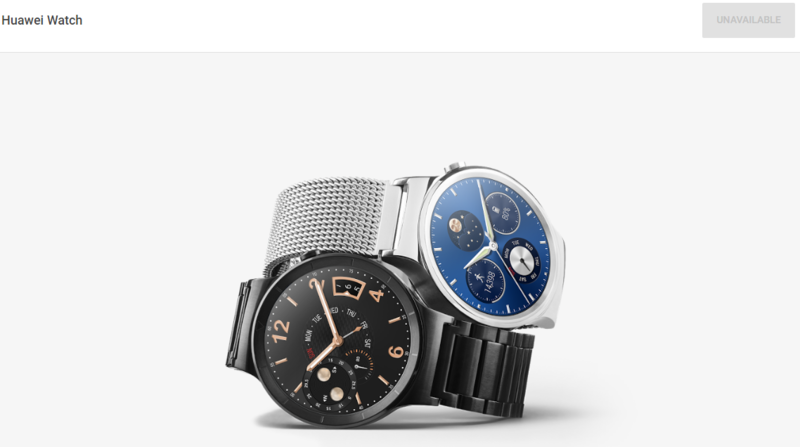 The standard Huawei Watch and the female-oriented "elegant" versions have been removed from the store. The page for the regular watch is still live via a direct link, but it shows as "unavailable." This leaves scant few Wear devices in the Google Store. There's the Nixon Mission, a few Michael Kors watches, the super-ugly Polar M600, and a few variants of the Moto 360 v2. You can still get a Huawei Watch from other retailers, but who knows for how long?